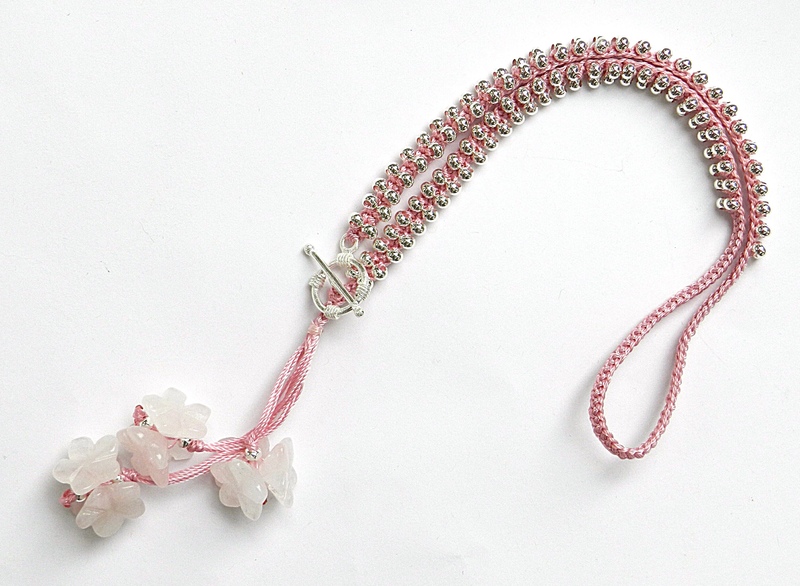 The delicate tone of rose quartz benefits from the addition of a coloured braid to enhance the subtle hues. In these designs pure pink has been used for the necklace and a mixture of pink and lilac has been used for the bracelet. 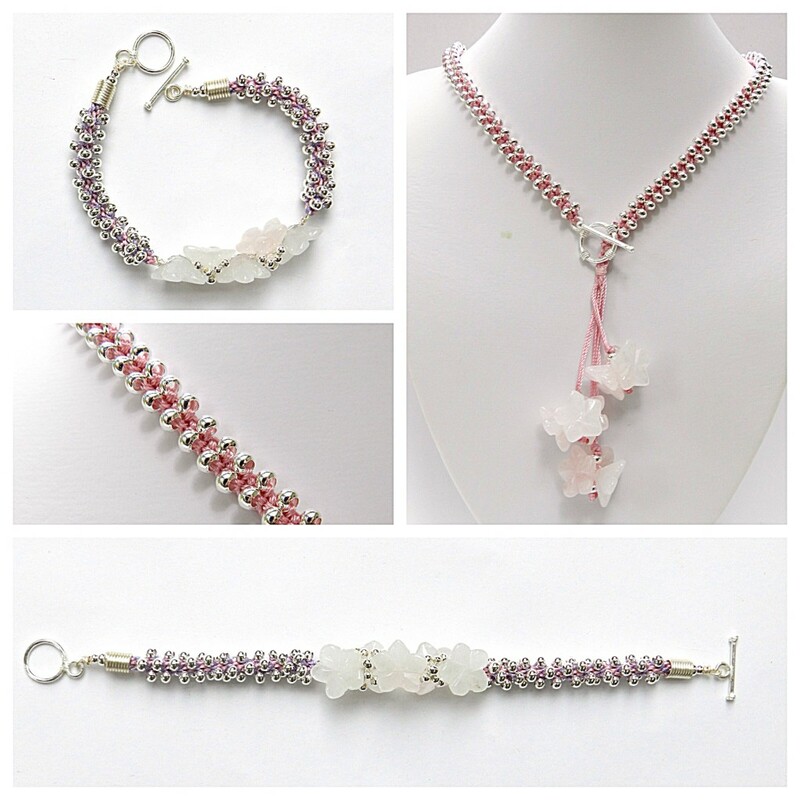 The silver seed beads work perfectly in these very floral and feminine designs. The necklace was demonstrated on Jewellery Maker on 24.6.14 and this is the link to the show. For this necklace the nylon thread sold by Jewellery Maker on large spools was used. S-Lon would work equally well. 1. Cut 8 x 3m of cord. 1. Thread all the cord through the small ring on the ring end of a toggle clasp. Centre the clasp and hold it in the middle of the hole on the kumihimo disk while the cords are positioned, 2 per slot, in the 8 slots on either side of the dots. 2. Braid for 8 moves using the Half Round Braid instructions. 3. Thread 30 size 6 beads onto the cord in slot 8 and the cord in slot 25. Add a bead each time these cords are moved, which will be every other full set of moves. 4. When the beads are used up braid without beads for 12-16cm. Check the length of the necklace will be correct before continuing. 5. Thread a further 30 size 6 beads onto the cord in slot 8 and the cord in slot 25. Add a bead each time these cords are moved. 6. When the beads are used up braid without beads for one full set of moves. Thread the ring on the toggle onto both the cord in slot 32 and the cord in slot 1, pull it through the hole in the disk and continue to braid for 1cm. 7. Bind the end of the braid with matching thread and add a drop of clear glue for extra security. 8. Divide the cords into 3 groups. For each group tie an overhand knot a few cm from the binding, thread all of these cords through a size 6 bead, thread three flowers onto different cords in the group and again thread all of the cords through a size 6 bead. Tighten up the cluster of beads and finish off with a knot. Trim off the excess cord and seal the knot with glue or by melting the ends. Feature beads of different shapes and sizes can be used in this manner. 1. Thread the beads onto a 20cm length of 0.8mm wire and turn a wrapped loop at either end. 2. Attach 30cm of 0.4mm wire beside one wrapped loop, thread on some size 8 beads and wrap around the flowers to produce a pretty effect. Secure the wire and trim. 3. Cut 4 x 50cm pink cord and 4 x 50cm lilac cord and thread it through the loop at one end of the flower section. Position the cords on the disk, 2 in each slot on either side of the dots. 4. Thread on 24 size 6 beads onto the cords in slots 32 and 16. 5. Braid using Round Braid and adding a bead each time a cord with beads is moved. 6. Finish off using either a glue-in clasp or a wired-on clasp and a coil of wire.